CLEVELAND (Ohio) - AN American woman had pleaded guilty to killing her boyfriend by sitting on him. Mia Landingham, who weighs 136kg, sat on her much smaller boyfriend, Mikal Middleston-Bey, after they got into an argument in August last year, reported police in Cleveland, Ohio. Mr Middleston-Bey only weighed 54.4kg, said the police. According to a Fox8 report, Landingham was sentenced to three years probation and 100 hours community service on Wednesday after pleading guilty to involuntary manslaughter. She was immediately released from jail. The report said that Landingham's attorney said there was a long history of domestic abuse in the couple's relationship and asked Judge Carolyn Friedland for leniency, saying Landingham had no prior criminal record. Landingham apologised for squashing the father of her children. The couple have three children together. 'I just want to say that I am sincerely sorry about this situation. I wish I could take it back,' she said. With only 2 nights to spare in Hong Kong last month, time was definitely not on our side. The main focus of our trip? To eat and shop! One dining concept which never fails to intrigue me is that of private kitchen dining. Private kitchen dining is like being invited over to a friend's place for dinner. Seating capacity is limited (usually restricted to just 4 or 5 tables), the venue is usually obscure, you eat what is being served and get to mingle with the owner -who usually also doubles up as the chef. Yellow Door Kitchen ranks quite highly as one of Hong Kong's top private kitchens. As one of the forerunners of private kitchen dining in the late ’90s, the one-Michelin starred Yellow Door Kitchen apparently attracts a star studded following which includes luminaries like movie mogul Sir Run Run Shaw, Japanese actress Takako Tokiwa and Hong Kong actor Andy Lau. We were fortunate to secure a dinner reservation on our first night in Hong Kong. The restaurant's dinner sets are pocket friendly, costing HKD 298 (or about SGD55) per pax excluding drinks. The restaurant does not impose service charge so tipping is encouraged. Locating the restaurant was very challenging. Nobody knows where the restaurant is located and the notorious Lan Kwai Fong slopes seemed bent on torturing our pampered tubby feet. After what seemed like eternity, we finally spotted a dimly lit sign beside a 7 eleven store which led us to our final destination. Phew. What an adventure. You can barely see the sign. Contrary to our perception of private kitchens, Yellow Door Kitchen is modern, swanky and highly westernized, complete with servers in crisp white uniforms. The chef draws much inspiration from Sichuan and Beijing cuisine so be prepared to douse the spiciness with lots of water or tea (The water dispenser was mysteriously "faulty" that night so we had to separately order bottled water and tea). I strongly recommend the eight treasures tea which leaves a fragrant pleasurable aftertaste in the palate and complements all the food items beautifully. Entrees: Pickled cucumber, sliced pork with spicy garlic sauce, fried slices of eel with orange peel, boiled edamame in distilled liquor, stir fried beef fillet with soya bean topping, slice bittergourd, corn kernels with lemongrass and seaweed salad with spicy sauce. Mains: Soup of porcini and chicken, chicken and shredded leek with spicy sauce, smoked pork ribs with honey and tea leaves, fried prawns in sichuan hot and spicy sauce, stir fried chinese asparagus, shanghai stuffed duck. The entrees were in minute portions and we were ravenously hungry. Nonetheless, we enjoyed the exquisite and clean flavors, our favorites being the addictively crunchy pickled cucumbers and spicy morsels of unagi accentuated with shavings of orange peel. We were also highly amused by the liquor infused edamame pods and lemon grass spiked corn kernels. With our appetites suitably revved up, we dug into the main courses with gusto. The clear chicken broth was nourishing and full of deep flavor. However, what really upped the ante were the subsequent courses of spicy saliva chicken and smoked pork. The pairing of meat and marinade was sublime, as was the play of textures and flavors. Hubby especially adored the smoked honey crusted pork rib, which effortlessly slid off the bone and crumbled in our mouths like a bar of Cadbury's Honeycomb. Char siew would never taste the same again. This was definitely a highlight of our trip. The next course comprised of battered prawns doused in a piquant Sichuan peppercorn sauce with diced peppers, garlic and dried chili. Here was another unforgettable dish- but in a different way. The prawns were big and juicy but the small peppercorns hidden within were also wickedly spicy. Our tongues were momentarily stung for a good ten minutes- but it was worth it. Our meal took a downhill slide from here...the subsequent dish of stuffed duck (purportedly the restaurant's speciality) was interesting but paled in comparison to the earlier meat dishes. It tasted like a glitzier version of the lotus leaf wrapped glutinous rice dish commonly served at Chinese wedding banquets in Singapore. Equally lack lustre were the dan dan noodles, which were simply doused in chili oil. Tasty but underwhelming. Dessert was wholesome, homely and highly satisfying. The chewy exterior of the dumpling burst forth with just the right balance of creamy black sesame goodness, resulting in a gooey mess which could only be described as heaven. All in all, it was an enjoyable meal. However, with so many other interesting private dining kitchens in Hong Kong yet to be explored, I doubt I'll be coming back to Yellow Door anytime soon. Da Ping Huo- Super spicy Sichuan cooking. Some say this establishment could give Yellow Door Kitchen a run for its money. Eccentic owners love art (Philippe Starck pieces in the bathroom!) and the lady boss is known to belt out some Chinese opera songs post dinner. There are 2 seatings- one at 630pm and the other at 9pm and the restaurant is closed on Sundays. Reservations required. Price is fixed at HKD280 per head excluding drinks. Bo Innovation- This is not a traditional private dining establishment. Helmed by long haired, tattooed and cigar touting Demon Chef Alvin Leung Jr, the cuisine has been described as "intelligent, humorous and thought out". If you are into molecular gastronomy, this is one restaurant you would not want to miss. If you have moolah to spare, order the Chef's Menu at HKD1080 per pax for dinner. If not, go during lunchtime and order the HKD198 set lunch or HKD680 Chef's Menu instead. Gong Guan- Another secret hideout which doesn't advertise much. This is a Shanghainese private kitchen so expect a menu that is less spicy but equally delightful. Check out some mouthwatering pictures here. Prices are HKD380 per pax for dinner with an additional HKD100 top up for corkage. 1 week prior reservation required. Mum Chau's Sichuan Kitchen- The most unpretentious private dining kitchen of all, with plastic coated tablecloths and disposable chopsticks. The restaurant can only seat 40 and is located in an undistinguished apartment building. Lunch is served promptly from 12-2pm (no reservations) and dinner is by reservation only. Specialties include the home made dumplings and hand thrown noodles. To order you are given a small yellow chit to tick against. Prices are relatively cheap and affordable. Dinner is HKD200 a head. Yin Yang- Chef/Owner Margaret Xu is the unofficial queen of organic food in Hong Kong and runs her own farm in Yuen Long. Her restaurant operates out of a four storey 1930s colonial shophouse where the roast chicken is purportedly "to die for". Unfortunately, prices are not cheap at HKD560 per pax for a set meal. By reservation only. Every year, when it is approaching Chinese New Year, my mouth starts itching for pineapple tarts. I love the open faced versions because they somehow seem to contain more pineapple filling (then again, maybe its just an optical illusion). Determined to come up with the perfect pineapple tart, I have been dutifully attending classes conducted by seasoned cooks, baking schools and homemakers for the past 3 years. This year is no exception. I attended one conducted by Anna Chan of Sugar Inc yesterday. Anna's a bubbly young lady with an infectious laugh and a voracious passion for baking. Although her pineapple tarts still fall short of my impossibly high standards, I had a good time and consider her recipe one of the better ones I have tried so far. Thoroughly combine Ingredients A together. Thereafter, rub in Ingredients B into Ingredients A with your fingertips until the mixture resembles breadcrumbs. Try to work in a cool environment as heat will affect the texture and taste of the final product. Use plastic gloves if you have warm hands. Mix Ingredients C together and stir thoroughly. Add the mixture into Ingredients A and B and stir gently with a spoon till well combined. Squish all the contents together with your hands and knead briefly till a dough comes together. Wrap in clingwrap and chill for 30 mins. After 30 mins, dust rolling pin and work surface lightly with flour. Flatten dough and place 2 chopsticks on either side. With the rolling pin, roll the dough to the thickness of the chopsticks. Dip the tart cutter (can be bought from Phoon Huat) in flour and shake off the excess. Press cutter down firmly onto dough, then press gently down the removable piece to make an indent in the tart. Lift up the cutter and remove the tart gently. Arrange the unfilled tarts on a baking tray lined with either aluminium foil or baking parchment. Make an eggwash (comprising 1 part of egg yolk and 1 part of water) and brush the unfilled tarts with the eggwash so that it will brown nicely in the oven later. Mash pineapple paste and hot water first using the back of a pestle or rolling pin. Then add rum and continue mashing till well blended. Measure 1/2 tsp of pineapple paste and roll into balls using wet hands. Set the balls aside. Preheat the oven to 200 degrees celsius (non fan oven) for at least 15 mins. 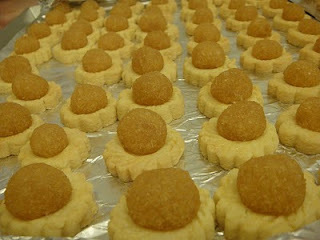 Place the balls of pineapple into the hollows of the pineapple tart bases. Bake for 12-15 mins until the tarts are light golden around the edges. Always bake the same sized tarts together so they will take the same amount of time to cook. Allow the tarts to cool completely before storing. Note: If you are too lazy too make your own tarts, you can order your stash from the below "tried and test" confectioners. Big and luscious open faced pineapple tarts. Owners are very generous with the filling, which is not overly sweet. The CBD crowd loves these tarts so much that the owners have set up a pushcart shop at Raffles Exchange this CNY to cater for increased demand. 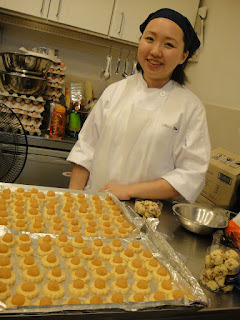 Traditional open faced Nonya style pineapple tarts which come in all shapes and sizes. (Apple shaped, jambu shaped, pineapple shaped- you name it, they have it!) Go for the biggest and most expensive ones- they taste exemplary. The ubiquitous golf ball pineapple tarts. Some folks swear by these and its not hard to see why! The beancurd tarts are worth a try too. This sounds too good to be true... free 7 nights' resort stay if you sign up for 24 issues of Her World magazine at a discounted rate of SGD130. Tried finding out more about the promotion (e.g. the identity of these resorts, whether the facilities are good etc)...but couldn't find any feedback from the internet. I think I might just pass- the last thing I want to do is to be stuck in an obscure resort with lack lustre facilities for 7 whole days! They are good ideas gone wrong. In this first video, the "vandalism" of Singapore's pristine white postboxes was actually a marketing ploy by SingPost to promote the Youth Olympic Games. Naturally the police were not very amused and the SingPost CEO was forced to apologize to the public at a news conference. Click here to view report by Reuters. Check out Singapore's Inkman in action! In the second video, the heartwarming OCBC commercial of an unsuspecting customer receiving a birthday cake on her birthday turned awry when a blogger decided to put the bank to the test and ask for a birthday cake on her birthday. The video really IS very heartwarming. I'll let you on a little secret of mine. For the past year, everytime I develop a craving for Japanese sushi and sashimi, the first word which pops up in my head is Tatsuya's. Tatusya's run by a pint sized Chinese guy called Ronnie. He's one of those local success stories who made it big through sheer sweat and grit. I like Ronnie's down to earth demeanor and unapologetically pocked marked face. It reminds me that life is not a bed of roses for everyone but success still awaits those who persevere. Despite relocating his restaurant from the now defunct Crown Prince Hotel to Goodwood Park Hotel, Tatsuya has somehow managed to keep its prices affordable. Folks with shallow pockets can still savour a taste of Tatsuya magic during lunchtime where set meals start from a reasonable 25+++ onwards. My favorite set lunch choice is the sashimi tempura bento which comprises of assorted tempura (shrimp, shitake mushroom, eggplant and okra), miso soup, chawanmushi, slices of sashimi and ume spiked Japanese rice dotted with seaweed and cubes of tamago. How the restaurant manages to squeeze so much value into a SGD28+++ meal is a mystery in itself. Every item in the meal is of utmost quality and freshness. The plump slices of sashimi bear nary a hint of fishy-ness and are firm to the bite with an unmistakably sweet aftertaste. Even the chawanmushi is perfectly steamed and dusted with lemon zest prior to serving, emitting a pleasurable bittersweet dimension to every bite. Of special mention too are the tempura prawns which are delightful to the last crumb and not overly oily. If you have yet to try Tatsuya's set lunch, you are undoubtedly missing out on one of Singapore's best kept secrets. Prior reservations are strongly recommended, especially during lunchtime. Full of interesting nooks and crannies waiting to be discovered. Lunch last week was an enjoyable affair. Safe for another couple, we were the only ones in the restaurant and were duly showered with the full attention of the staff. Even the ice in our drinks was individually refilled from little ice buckets. The egg in my oyako don was a little too undercooked for my liking with some tranparent runny stuff still visible. The marinated chicken pieces were tender and went really well with the egg and the rice. However, in my humble opinion, it was nothing worth raving about. The kurobata pork was what really stole the show, with its melt in the mouth texture. It was perfectly complemented by sauteed onions and fluffy Japanese rice. Dessert just comprised of a slice of dragon fruit each. Feeling unsatisfied, my kaki and I ordered a scoop of black sesame and matcha ice cream to share (SGD4 per scoop). Presentation was lovely but the ice cream didn't quite make the cut, with bits of icicles still trapped in every bite. I like this place for its ambience and quaint location (just alongside the promenade). It would be nice if yakitori could be served during lunchtime. However, till then, I'll guess I'll just have to make a return visit during dinnertime. Most people had a crappy 2009. I would like to say so myself but the truth is that it wasn't all that bad for me. 2009 was first and foremost a year of travel and discovery. I ate like a king, shopped till my feet literally bled, visited new places and unceremoniously piled on a few kilos along the way. 1. Eating cod sperm sushi in Tsukiji market without knowing it. We had just completed an amazing personalised tour of the market with funky English speaking guide Mr Naoko Nakamura. When we asked him for dining recommendations thereafter, he nudged us into this minuscule sushi shop which was so packed that we had to hunch our bodies as we ate. The sushi was the freshest we had eaten in our entire lives and didn't cost an arm and leg. The only problem was that we didn't know what we were eating half the time. Thankfully, all the items were great except for the cod sperm sushi. Cod sperm is an acquired taste- it resembles harmless mayonnaise but tastes vile and metallic. Not wanting to disappoint the earnest looking chefs, I put on my best smile and held my breath as I tried to swallow down the contents as fast as I could. 2. Taking my first (and last) budget airline flight. Due to bad planning on my part, all SQ and Cathay flights to Hong Kong were fully booked by the time I finally decided to book our holiday to Hong Kong and Macau last month. In desperation, I decided to fly with Jet Star and paid dearly for it (SGD600 for a return ticket). Legroom was pathetic and the plane was small and dingy. Worse still, I was seated beside an obese woman with horrendous BO. Urgh. Worst flight experience ever. 3. Feasting on Nasi Kunning in Manado. Nasi Kunning literally means yellow rice, due to the tumeric. Unlike Nasi Kunning found elsewhere, the Nasi Kunning in Manado is wrapped in woka leaves from local sugar palm plantations, which open up like a pretty accordion in your palm, revealing a treasure trove of rice, sambal, a steamed egg and minced beef. It was an unexpected find which tasted so good that I lugged home 20 packets to share with family and friends.